Nortek Global HVAC has revamped and improved its Micro-Channel coils website to include even more training and technical content. It is part of the company’s ongoing mission to provide the latest online educational resources for today’s busy HVAC contractor. Functionally, the revamped site offers a wealth of information, including performance benefits, charging best practices, history, and additional resources for training and education purposes. What’s more, the company is running a sweepstakes to encourage training and offer contractors the chance to win one of several prizes. 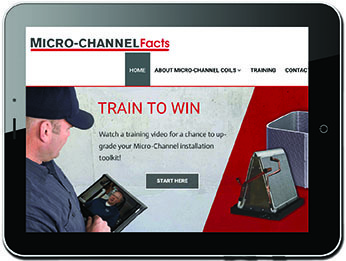 For more information about Micro-Channel coils or to enter the training sweepstakes, contractors and distributors should visit the new website at www.microchannelfacts.com. Nortek Global HVAC has been designing and manufacturing reliable heating and cooling products for more than 95 years. The company focuses on creating genuine value for its customers through a unique combination of innovation, product performance and responsive support. Nortek Global HVAC and its subsidiaries build and sell HVAC systems under the Maytag®, Broan®, Frigidaire®, NuTone®, Westinghouse® and Reznor® brands, among others. To learn more about Nortek Global HVAC and its product offerings, please visit www.nortekhvac.com. Trademarks Broan, Frigidaire, Maytag, NuTone and Westinghouse used under license.